Welcome to our home page. Our association was established by legislation in the 37th Parliament, First Session - in Bill 65 on May 10, 2000 with all party support. 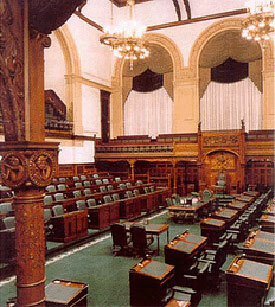 Bill 65 was the first bill in Ontario's history to be introduced not by a private member or by a government party, but by a committee - The General Government Committee. The Chair, Steve Gilchrist was the primary sponsor and committee members from all three parties were secondary sponsors: Toby Barrett, Marie Bountrogianni, Ted Chudleigh, Garfield Dunlop, Dave Levac, Rosario Marchese and Julia Munro. We are grateful to the committee members and the house leaders at the time - Norm Sterling (PC) Dwight Duncan (L) and David Christopherson (NDP) for their support. Our primary objectives include offering our experience in support of parliamentary democracy in a non-partisan way, to foster good relations between current members, and to serve the interests of former parliamentarians. Towards these ends we issue periodic newsletters, conduct an Annual General Meeting which also acts as a reunion with current members, and offer our support to various parliamentary activities - this year including the legislative assembly page program. We also work to better understand how former members of Provincial Parliament fare after public life, and do our utmost to track all former members and look into their well-being. We are pleased to say that the Speaker of the Assembly has been very supportive of our association in a number of ways, most recently directing that the flag in front of the legislature be flown at half mast when a former member dies - a symbolic act that means a great deal to the families and demonstrates honour towards all members. We thank the Speaker for his support of our organization and objectives. If you are aware of any former MPP that has not been contacted by our association, please send us the contact information. We hope you find this site informative and if you have any inquiries please feel free to contact us.